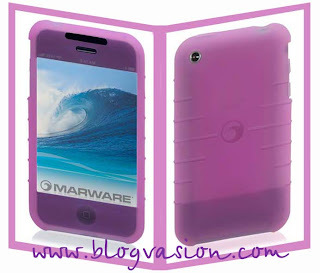 Marware’s $14.99 Sport Grip for iPhone is a silicone skin case for the iPhone that’s available in blue, pink, clear, and black. The Sport Grip provides simple protection for the iPhone while leaving all of its controls easily accessible. The Sport Grip has a large opening at the front for accessing the iPhone’s touchscreen; you also use this opening to insert and remove the iPhone from the case. The front of the case also includes small holes for the iPhone’s earpiece and proximity sensor as well as an indentation over the Home button that makes it easy to locate by touch. The back of the case has a small opening for the iPhone’s camera lens, and holes in the edges of the case let you get at the iPhone’s headphone jack, Ring/Silent switch, microphone, speaker, and dock-connector port. Rather than leaving openings for the volume buttons and Sleep/Wake switch, Marware has chosen to instead provide small nubs of silicone over those buttons to let you operate them through the case. The company also includes a thin, adhesive screen protector along with the necessary tools for applying the film to the iPhone. The ridged sides of the case make it easy to grip and the slightly tacky-feeling silicone means that the phone won’t slide off a table or other smooth surface, though that texture also means that it’s more troublesome getting the phone in and out of a pocket. The silicone on the back of the case is somewhat thicker, giving the Sport Grip a solid, comfortable feeling in your hand. The silicone material gathers a decent amount of dust and lint, some of which can become trapped between the case and the phone, but this is a problem we’ve encountered with several cases. Overall, the Marware Sport Grip is a respectable entry among silicone iPhone cases, and it’s a fair sight cheaper than many of the others we’ve tested.